NASA: Study Finds Ancient Warming Greened Antarctica | Watts Up With That? It seems Antarctica once had vegetation and had a lot of rain. PASADENA, Calif. — A new university-led study with NASA participation finds ancient Antarctica was much warmer and wetter than previously suspected. The climate was suitable to support substantial vegetation — including stunted trees — along the edges of the frozen continent. The team of scientists involved in the study, published online June 17 in Nature Geoscience, was led by Sarah J. Feakins of the University of Southern California in Los Angeles, and included researchers from NASA’s Jet Propulsion Laboratory in Pasadena, Calif., and Louisiana State University in Baton Rouge. In case you are wondering (as I did) this is the orientation of the continents 20 million years ago during the Miocene period. This is grerat news! What we need to do, however, is to storm the citadel that is education. In the UK, at least, intelligence and learning are the antithesis of education, whose main goal is compliance. Until we get a foothold there, kids will come out of factory-schools believing that the fairy-tails peddled by the IPCC and government departments are true. None of these speculations can explain the Piri Reis map, which is known to antedate Columbus, and is more accurate on then-unexplored parts of the world than the known regions. It shows Antarctica as it would exist without ice. I think these guys failed the test were you have to put the shaped objects into their matching holes. They are looking right at yet still missing that maybe, just maybe, the heightened CO2 levels were the result of the warmer temps. OY! And human produced CO2 had NOTHING to do with it! Except CO2 was mostly around 250 ppm during this time period. Temperature vs CO2@3.0C per doubling over the last 40 million years for a little more perspective. I think the temperature estimates here are probably very consistent with what this study found. 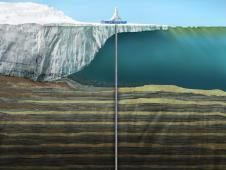 Some of the other developments such as ocean currents and continental arrangements which changed over the time period. Sorry about the “CO2 @ 3.0C”. hadn’t realized that would create a link. The Warmist will never except that modern climate conditions can be as variable and changing as it always has, it would just ruin their dream of a UN one world government and all that lovely money flowing into thee power elite and socialist pocket’s. It was never about climate otherwise the earth climate history would be enough to be put this hoax to bed before it even got started. Yes they do. They know it was high because the temperature was high. What they don’t know is why the temperature was high, and whether CO2 played a significant role as a cause as well as an effect. Hmmmm… sounds like we have quite a ways to go before we experience ‘unprecedented’ warming. Climate scientists seem to have jumped the gun. I seem to remember that Captain Scott found coal down there on his last expedition. Where are the airplanes and rockets? NASA=National (ok I get that part of this study), Aeronautical ( sorry I don’t see what this has to with aeronautics, and I have degree in aeronautics), and (ok I get “and”), Space (gee I don’t see how drilling a hole in the Earth has anything to do with space), Administration (Ok so they they are a bureaucratic arm of government). Why is NASA doing these studies at all? Is there something significant about this statement? I supposed I am supposed to connote some dire meaning. Climate science! “scientists do not know why carbon dioxide was this high” — must be all of them prehistoric SUVs. Heard Fred Flintstone used to drive a hummer. 400 to 600 ppm of CO2, everything else equal, will warm the planet, but the question is how much? If the only important difference between the earth today, and 15 million years ago, was the difference in CO2 levels, then we might well get to the warmth of 15 million years ago. And the large rise in sea levels that would likely occur if Antarctica warmed to the degree in this study. But there were important differences in ocean circulation patterns that have been argued to have caused the earth to be warmer in the relatively recent past than today, at about the same CO2 levels. One such difference, noted in the map above, is that Central America was not yet completely land, there was a substantial water gap between N and S America. This gap, through which one ocean flowed into another (can’t do that today), and some differences in the Arctic, have been argued to make most of the earth warmer about 3 to 4 million years ago, when CO2 levels were about the same as today. Complex, but it has to do with distribution of heat circulation. A paper which doesn’t look at that argument, but merely shows that the world was warmer in the mid-Pliocene (3.5 to 3 million years ago) is Dwyer and Chandler, “Mid-Pliocene sea level and continental ice volume based on coupled benthic Mg/Ca palaeotemperatures and oxygen isotopes.” Phil. Trans. R. Soc. A (2009). This paper shows that at a time when CO2 levels were about what they are now, sea levels varied between 20 to 25 meters higher or lower than today (65 meters lower than today at 3.3 million years ago), with a majority of the time below today’s levels. A look at the graphics in the paper appears to show periodicities not too different that the 100,000 year cycles between interglacials. In other words, it looks like Milankovitch cycles might have been in operation, but because the earth was warmer, the cycles didn’t put us into ice ages, and the peak of the “interglacials” of the mid-Pliocene had sea levels about 20 to 25 meters higher than today. So we can look at the research in the paper featured in this blog entry, showing the edges of Antarctica being just warm enough to have some stunted trees, and we can think of the warmth of that time having two reasons for being warmer than today. First, the earth was warmer because land forms caused different ocean circulation patterns, and so (as in the Dwyer/Chandler paper) the earth was warmer even when CO2 levels were similar to today. Second, the earth was warmer due to higher CO2 levels of 15 million years ago. Clearly, if Antarctica got warm enough to have stunted trees, sea levels would be substantially higher than today, a big problem. But we can’t take the results of this paper as being for an earth analogous to today’s. Obviously, we have to avoid sea levels substantially higher than today, but we need to get the science right before we bankrupt economies. We really should make it a priority to do so. O / T JoNova’s site is now up and running again. I’ll go back and read for a bit, and check the supposed time frame, but all of these paleo studies…. the ones that go back millions or hundreds of thousands of years…. …. does the continental drift come into play on any of this? Putting the cart before the horse a little bit, aren’t we? And well, howdy-doody, we suddenly have a window into its PAST. Those nasty Miocene Humans, messing with the climate. Oh, and gee, those oceans didn’t boil after all, now did they, Jim? Jim? Uh…oh never mind. Did they ever find out what screwed the climate up and made it so cold after it was so nice and warm and toasty? I hope they don’t let that happen again. Bill, I have never seen any data that look like your chart before. Where does it come from and why is it that you say paleosols aren’t reliable? On the topic of this study: The question of what was happening near the poles always seems to preoccupy those looking at the paleo record who want to pant scary scenarios for future warming. But this always exaggerates the size of the changes, since polar climates have always been very variable. During the Eocene, for instance, there is a significant problem with models trying to explain the polar warmth while simultaneously not warming the tropics too much. The magnitude of this problem was worse before there was an extensive effort to get the tropical data to be warmer than the present, because it used to be models gave too cold of poles and too warm of tropics. The data naturally got “fixed” to better agree with models, so that now models apparently can match the tropics…but only if their poles are still much too cold. It would not at all surprise me if the evidence from the Miocene also indicated a significantly reduced equator to pole temperature difference. The way “climate scientists” speak of this, it is as if they are not interested in asking why this should be the case: temperature changes are basically assumed to follow the Budyko-Izrael distribution automatically. Everyone knows that climate change means death. 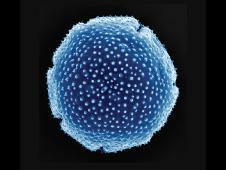 How could there have been pollen in Antarctica? Halliburton or Bush or the Koch Brothers must have planted that pollen by directional drilling or fracking or drones or something. And now they’ve even got NASA in on the act. We hear that our atmosphere is getting thinner. Could it have been thicker back then, where the adiabatic lapse rate would produce the higher temperature? It wouldn’t take much at 2 °C per thousand feet. I agree that Ocean circulation and plate tectonics does come into play when you go back this far. I think that the circum-Antarctic current was just getting started about 20 MY and that’s why there was global cooling after that time relative to before. There is also the closing off of the connection between the Atlantic & Pacific in the Americas that ended a current that would have eliminated that warming current. Was this study conducted by graduate students or post docs from a different discipline? Their knowledge of what work was done before is severely lacking. Was there no academic lit search? Dude, we already knew that. (Look up the work of Haq, Berggren, Bartek, Vail, Al-Fares, Al-Qahtani, and a dozen others for starters.) 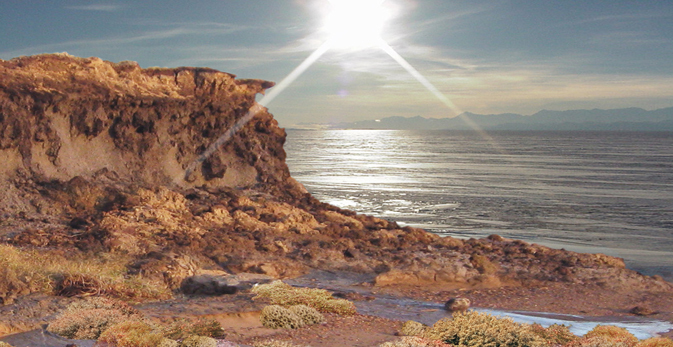 The Miocene Thermal Maximum had sea levels 150m higher than present. That condition was reached three times between 18mybp and 14mybp. (The polar ocean equivalent data suggest the max temp was closer to 9,5°C warmer than now, but that is ocean temps. Surface temps could have been warmer than that.) Major Antarctic re-glaciation didn’t happen until around 12.5mybp as the climate continued a protracted decline to reach colder-than-present conditions for the first time in the Cenozoic. It is reprehensible for them to suggest that those conditions are at all relevant to what the climate is capable of in the near future. At the very least, the notion that CO2 levels now are approaching levels back then should demonstrate CO2 is not what is driving the climate and the recent high levels will not melt the West Antarctic Ice Sheet. We are no where near the warm conditions of any of the Pleistocene Interglacials. And those sea levels only reached 50m higher than present at their warmest, not the 150m of the Early and Middle Miocene. “Back then” it appears that Florida was beneath the waves but 80% of Greenland was ice free. Some would consider this a win-win situation. People may be interested in a 2006 study that also combined modelling with proxy data in order to estimate what contribution CO2 may have had to the climatic changes of that period. Now that is deeply offensive. Sure I don’t love it here all that much but to hear someone say such a thing about my State…wow. So Antarctica can warm by 7 C and not send the world past a tipping point of Venus proportions? Just as history has a lot to teach us about the future, so does past climate. Yes, it shows that there was no runaway warming, the land was more productive, and there’s nothing to fear if Antarctica were to lose ice. Ah, the Miocene. The Garden Epoch. Forests from pole to pole, almost. The Earth teemed with life. Not too hot, not too cold. Green everywhere. The perfect climate. We can only hope and dream. Warmer Is Better. Pass it on. So what is suypposed to be new here? It has long been known that Antarctica was last partially ice-free in the Middle Miocene with tundra and Nothofagus beardmorensis scrub along the Ross Sea coast. It all froze up completely about 14 million years ago and has remained frozen ever since. This is just old knowledge regurgitated. Continental drift explains the coal deposits (yup, Antarctica has coal — wait’ll China finds out the Madrid Protocol banning mining in the Antarctic expires in 2041) and the dino fossils from the Cretaceous. Antarctica had already settled into its present location by the Miocene. At the same atmospheric pressures as those in Earth’s atmosphere, Venus is almost exactly the temperature it should be by the SB solar heating calculations. And Venus’s atmosphere is 96% CO2.. Obviously CO2 has very little effect on temperature. Venus’s surface temps are due to the much larger atmospheric pressure. I have an old photograph of grooves in a large sloping rock. I was told this was due to ancient glaciers. It seems that back in the time of Gondwanaland, some 200 million years ago, the South Pole was nearby. The photograph was taken in Southern Rhodesia, some 4,000 feet above sea level in the 1930s. What is now Antarctica would not have been under ice at that time. Antarctica is awash with coal deposits, fossil evidence of beech forests, ferns and the like, and fossilised tree trunks (just ask the paleobotanists) and…… undoubtedly, oil…ask ‘big oil’. I’m struggling to grasp why it is that NASA consider their study insightful. It is true that a few may think of Antarctica as the fabled, interminable and immutable ice desert substantially bereft of animal and plant life as we know it but reality presents a different image, and this is well documented prior to NASA. Hmmmm…’do not yet know precise…’ = have absolutely no idea but spun up correctly guarantees money for more fun research in exotic places. It may be worth mentioning that the Drake Passage was already about 20 million years old at the time this study refers to, so I don’t think it can be a factor in the temperature variation there. Why doesn’t Ted just ask instead of fantasizing? Simple question: hey mr warmista, do you believe climate conditions can be highly variable? Why do we have to avoid sea levels substantially higher than today? Even if sea defences are not able to restrain the ingression, there is plenty of land on planet Earth, and there still will be plenty of land even if sea levels are substantially higher. Indeed new areas of land will open up such as the Antarctic. As long as sea level rise is relatively slow, we (and other living things) will simply migrate inland as the sea levels rise. There will be no big problem. The threat posed by sea level rise is over-stated, and this is a good thing since it may well be the case that we cannot control sea level rise as it is a function of natural variation and not dependent upon the extent of manmade CO2 emissions. . Certainly for mankind. 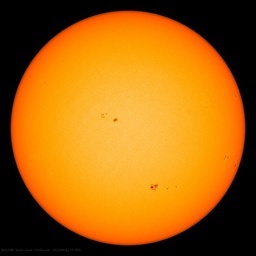 As an animal species, we would greatly benefit from the planet being 5 to 8 degC warmer than today. Given the present cool conditions on planet Earth, if it were not for our skill of adaption, our natural habitat as a species would be restricted to the tropical rain forests, the outback of Australia and a few other similar places. We certainly would not be inhabiting much of of the Northern hemisphere. I was being slightly facetious. It always seems that when I discuss this issue with my environmental friends, who think science is done by press release, they always seem to raise Venus as an example of where the world will end up if we don’t stop our evil ways. Considering they have iphones, ipads and all the other constantly connected popular gadgets (which I find quite ironic) it astounds me just how uninformed they are. The Antarctic peninsular was covered by trees during the Cretaceous, evergreens like pines, but most of the peninsular is north of the Antarctic Circle so still gets a small portion of winter sun. Fairly important if you are a plant. All the research I have seen confirms that the main landmass of Antarctica was ice bound despite higher temperatures and sea levels though there may have been melting along the coast during summer in places. “Some of the other developments such as ocean currents and continental arrangements which changed over the time period. Thanks for the reliably valuable geography notes. In my country, the arable land is near the coast. Inland is a desert. Potentially agriculture could move inward without much fuss – assuming that the sandy soil quickly becomes nutrient rich, water sources for irrigation appear, and the indundation happens over centuries instead of decades. Otherwise it could be quite a costly relocation. But my country is one massive island. For continents with many countries, the migration of green belts from one state to another could be disastrous for the original. As always, the point is not that the climate will change – it always has and will. it’s about the rate of change, and particularly when our heavily populated civilizations are dependent on a stable agriculture. I think this is all about perspective. What the authors fail to point out is that CO2 was actually dropping from the Eocene (around 800 ppm or more according to GeoCarb III) through the Miocene. As well the climate wasn’t warming at this time period it was actually cooling and glaciers were advancing throughout the Miocene (according to the papers I’ve read). They just happened to look at a point in the Miocene where the glaciers had not advanced as far as they would by the end Miocene time. Also sea level curves over the period Eocene through end Miocene show a general decrease. I have a database of CO2 estimates that I continually update as new estimates become available. There is one series and one methodology that I have excluded, Pagani 2010 which used a new methodology that produces CO2 estimates that are much higher than the ice cores in the period they overlap so we have to assume this methodology is not accurate – I’ve excluded another methodology, paleosols or fossil soils or pedogenic carbonates, since this method has been shown to not be reliable since it depends on the time of year or season that the samples were laid down and this varies by large amounts throughout a season (0 ppm to 3000 ppm) so it is not reliable. The sources for the CO2 data are: the Antarctic Epica DomeC ice cores, Pagani 2005, Pagani 2008, Berner GeoCarb III, Royer 2004, Royer 2006, IPCC AR4, Pearson 2000, Pearson 2009, Triparti 2009, Bao 2008, Honisch 2009, Seki 2010, Beerling and Royer 2011 and Bartoli 2011. The warmer temps were “associated” with high CO2 levels. Higher res ice core records also show an association – with CO2 levels lagging behind temp changes by a few hundred years. Whatever else the author – or you – may extrapolate with regard to cause-and-effect is pure supposition with no evidence to back it up. This study certainly has no evidence for CO2 causing the warmth as opposed to vice versa. It just doesn’t have the resolution for that. You can believe what you prefer, I’ll take evidence every time. No matter how you look at it, this casts further doubt on CO2-induced CAGW. The study suggests that CO2 levels were 400 – 600 PPM at that time; we are approaching 400 PPM and there is no sign of temperatures increasing by 10 degrees C. Except for the Antarctic Penninsula, temperatures in Antarctica are level or slightly cooling. If, as Bill Illis, suggests, CO2 levels were closer to 250 PPM, then one has to ask, what was the reason for the higher temperatures at a time when CO2 levels were much lower than today? Until the Drake Passage opened Antarctica was largely ice-free (except for mountain glaciers in the interior). After the Drake Passage opened the ice advanced all the way to the coast for the first time (the Oi-1 glaciation). 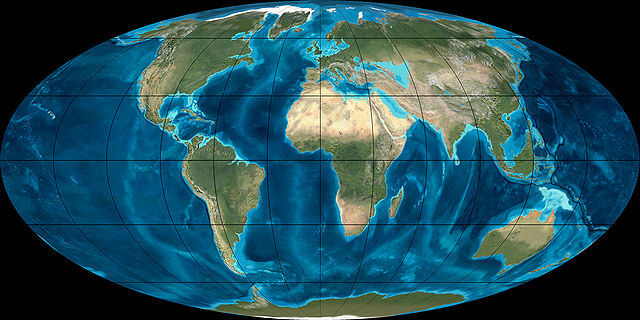 During the following 20 million years the ice fluctuated, with some coastal areas being intermittently ice free, but most of the Continent wwas permanently glaciated. Then 14 million years ago the ice advanced to the coast for a last time, and has stayed there. Warm conditions during the middle Miocene are thought to be associated with carbon dioxide levels of around 400 to 600 parts per million (ppm). In 2012, carbon dioxide levels have climbed to 393 ppm, .. This is being dishonest. Far, far higher levels of co2 were unable to stop ice ages. Co2 is more potent than previously thought!!! My point exactly! Sea levels could rise a hundred meters or more, and as long as it didn’t happen overnight, there is NOTHING to be concerned about. Okay, if you own some ocean-front property (or any land within a few miles of the coast, or anywhere in Florida or Louisiana, then you’re going to lose that land. But we’re not talking about the effect on individual landowners; we’re talking about the effect on the world population of humans. total land area will decrease, by perhaps ten to twenty thousand square miles worldwide. But LIVABLE land area will INCREASE by much more than that. Hundreds of thousands of square miles of land, currently too cold to support human habitation, will be opened up for settlement. Vast stretches of Siberia and Canada. The interiors of Greenland, Iceland, and Scandinavia. The Hudson Bay will become the new Club Med. Of course, a hundred meters is not what we’re talking about. That would take thousands of years (the worst predictions, well worst REALISTIC predictions, of sea level rise are around 2 feet per century). It would take longer than all of recorded human history for sea levels to rise a hundred meters, even if global warming continues unabated. And sometime during that period, the glacial/interglacial cycle is going to turn south again, driving the climate back into the depths of the current ice age, and nullify any temperature gains (and land loss) due to AGW. Unless, of course, we can do something to stop the natural climate cycle of the planet. It is my most fervent wish, for the future of humanity, that the global warming alarmists are RIGHT, and that we really CAN control the earth’s temperature, to a significant degree, through anthropogenic emissions of greenhouse gasses. Because if we can’t, then about 10,000 years from now, the human race is REALLY going to be in trouble. Not the kind of pissant trouble the alarmists think we’re in now, but REAL trouble. And your great (x300) grandchildren will be fighting for survival against bitterly cold temperatures, complete lack of agricultural production, and global wars fought over the few remaining resources. Personally, I don’t think we can do anything to avoid it, no matter how much fossil fuels we burn. But if we don’t at least TRY to stave off the coming glacial period, then we will be condemned by 3,000 generations (100,000 years – that’s how long the glacial period will last) of future humanity. No matter how you look at it, this casts further doubt on CO2-induced CAGW. The study suggests that CO2 levels were 400 – 600 PPM at that time; we are approaching 400 PPM and there is no sign of temperatures increasing by 10 degrees C. Except for the Antarctic Penninsula, temperatures in Antarctica are level or slightly cooling. That’s not exactly surprising. Because of the circumpolar winds and currents, Antarctica is relatively thermally isolated from the rest of the planet, plus you have the thermal inertia of the ice sheet itself. More than one study has predicted a slower start for warming to affect the Antarctic region. But the time scales involved are quite different. I haven’t seen a copy of the study (paywalled) but it appears it is speaking of resolution no finer than thousands of years – not decades. But lets look at the figures: 10C increase in summertime temps in the Antarctic. That may have taken thousands of years with a slow rise of CO2 (playing DA on behalf of the mainstream view). Now lets look at the Arctic. Annual temps there have increased by nearly 1.5C over 3 decades. A straight extraolation makes that almost 5C over 100 years, and if CO2 continues to rise to 600ppm by 2200, then the rise could be as much as 10C over 200 years. Presumable Antarctica will have started to warm in that time. Or at least, that would be the mainstream view. But there are other differences regarding tectonic arangement and ocean circulation and heat transport, so it’s not a straight apples to apples comparison in the first place. The study I linked above examines a number of other factors that may account for the seemingly greater warmth 15-20 million years ago. This study neither proves nor disproves AGW, nor does it put a constraint on climate sensitivity. It does add to knowledge, and there is no need for over-interpretation of the, quite qualified, findings. And a decent climate skeptic should keep in mind that this study relies on ancient proxies and modeling. Normally this would render the paper extremely suspect. but I personally hope that, rather than overlooking these traditionaly suspect elements because there is some grist to the skeptic mill, skeptics have instead decided that proxies models can be useful, if not perfect. That has nothing to do with the Miocene. That coal could well have been from an outcrop of the Carboneferous a period when Antarctica was part of Gondwana. Yes, the late Miocene was warmer, considerably, than today, with lower CO2 levels. What could have created such a warmer world, if CO2 wasn’t the culprit (which obviously it wasn’t)? This is the point I was making in my 7:20 PM comment above, that ocean circulation patterns changed because of the closing of the isthmus which connected the Atlantic and Pacific somewhere around 3 to 3.5 million years ago, and the change in patterns eventually resulted in a cooler world, with little change in CO2 levels. So you can’t take the mid-Miocene, with up to 600 ppm of CO2 and much warmer than today, as a model for what would happen if today’s much cooler (baseline) world went to 600 ppm. Again, in response to a previous comment, it is certainly possible that sea level rise could be a major problem, for example if it were to rise 10 feet. I’d like to see the costs of losing that much coastline, that much farm land, and having to enclose that many coastal cities to prevent constant flooding. But I am NOT saying that 600 ppm or 900 ppm would create sea level rise like that, we need to get the science right before we can say something like that. For starters, it depends on whether we would stay at such levels for hundreds of years – it isn’t just the level of CO2, but for how long. Also, Lady Life Grows, about the Piri Reis map. How about 450 ppm in 1940. Why are direct chemical bottle CO2 measurements almost totally ignored by people just because the warmists prefer to ignore them? Some 80,000 measurements by many different researchers—EE Beck’s Paper. For number of years geology professors have been teaching about the warm Antarctic during the early Tertiary, so this is hardly news. We have known for some time that there were herbiverous dinosaurs there in the Cretaceous. Miriam Katz has written extensively on the development of the Antarctic Circum Polar Current in late Eocene or Early Miocene time, a development which stopped the warm Pacific waters from reaching Antarctica and warming its climate. From such effects it is easy to see that ocean circulation, which is obviously greatly influenced by plate tectonics, is the main driver in long-term global warming and cooling. Refer also to the rise of the Isthmus of Panama, and its effect on the Pacific Current warming the North Atlantic (current work by the U. of Florida, et. al. One author said that this rise, cutting off the warming effect of that current, “created the Arctic”. There is much to be said for tht argument, since there seems to have been little or no Arctic prior to the rise of the Isthmus in the Miocene. Ocean currents and plate tectonics don’t leave much room for anthropogenic global warming.